ETFGI reported that ETFs and ETPs listed Globally gathered net inflows of US$44.31 billion in February, bringing year-to-date net inflows to US$61.66 billion…. 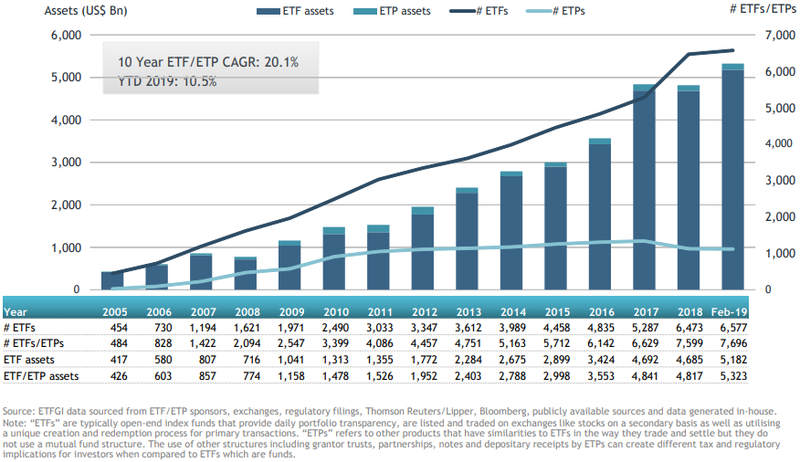 Assets invested in the Global ETF/ETP industry reached $5.32 Tn in February 2019, the highest on record. Happy 39th anniversary to the ETF industry – first ETF the TIPs – Toronto 35 Index Participation units was listed in Canada on March 9, 1990. 61 consecutive months of net inflows into ETFs/ETPs listed globally. “Throughout February markets pushed higher, resulting in the best start to the year since 1996, with major US indices comfortably erasing any hangover felt from the Q4 ’18 market rout. US-China trade talks appeared to have made good progress while Brexit stalled even with the 29th march deadline looming. Central banks in the developed economies have maintained an accommodative stance to ease growth slowdown fears, with the US Federal Reserve reiterating their new ‘patient’ policy stance. The S&P 500 was up 3.21% by the end of February bringing year-to-date returns to 11.48%, similarly the S&P Europe 350 was up 3.45% for the month, with year-to-date returns of 9.89%. The Topix 150 finished February up 0.33%, with year-to-date returns of 7.62%. Emerging and frontier markets saw more modest gains, finishing February up 0.74% and 2.62%, bringing year-to-date returns to 8.56% and 7.35%, respectively.” according to Deborah Fuhr, managing partner and founder of ETFGI. At the end of February 2019, the Global ETF/ETP industry had 7,696 ETFs/ETPs, from 411 providers listed on 72 exchanges in 58 countries. Following net inflows of $44.31 Bn and market moves during the month, assets invested in the Global ETF/ETP industry increased by 3.15% from $5.16 Tn at the end of January, to $5.32 Tn. Equity ETFs/ETPs listed Globally attracted net inflows of $28.62 Bn in February, bringing net inflows for 2019 to $19.79 Bn, substantially less than the $90.95 Bn Mn in net inflows equity products had attracted by the end of February 2018. Fixed income ETFs/ETPs listed Globally attracted net inflows of $14.71 Bn in February, bringing net inflows for 2019 to $38.38 Bn, greater than the $13.72 Bn in net inflows fixed income products had attracted by the end of February 2018. Substantial inflows can be attributed to the top 20 ETF’s by net new assets, which collectively gathered $27.20 Bn in February, the SPDR S&P 500 ETF Trust (SPY US) gathered $3.09 Bn alone. Substantial inflows can be attributed to the top 10 ETP’s by net new assets, which collectively gathered $1.78 Bn in February, the VelocityShares Daily 2x VIX Short Term ETN (TVIX US) gathered $364.93 Mn alone. Investors have tended to invest in large cap equity/fixed income ETFs in February.